Feel free to ask me about it. Scalable solar reflector design by Philip King. There seem to be a million different designs for solar cookers. I've chosen to experiment with this solar reflector design by Philip King. It looked simple and used materials I already had, or could easily find. 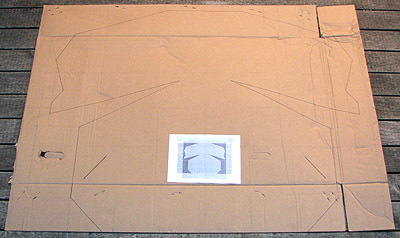 And it is scalable to whatever size piece of cardboard you can find. 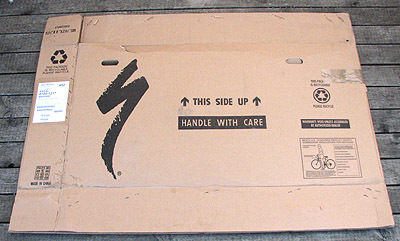 A used bike box from the local bike shop. Aluminium sisilation. I still have some reflective underfloor insulation left over from by previous insulation efforts. PVA Glue. 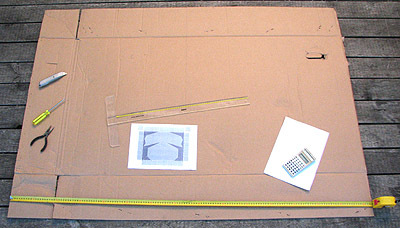 Used to glue the sisilation on to the cardboard. Black pot. I bought a second hand pot for $5 at the market and spray painted it black. 1/2 height glass AG jar. Used to raise the pot a bit (so that it benefits from some light on the bottom of the pot too). We happened to have a few (thanks Timbo!). The plans [PDF] download and print out. 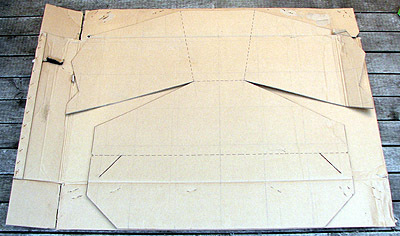 Cut the box into two halves - down the corners that have joins. Select the nicest of the two pieces. The nice thing about this design is that it will scale to any size, based on a 8 x 6 square block grid (the purple squares shown on the image at the top of this page). Pick the smaller of those two results - ie 180mm. That's going to be the size of the square "block". 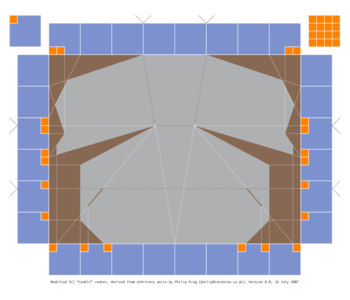 Mark off all the required quarter marks (the orange squares on the image at the top) as shown on the plan. With the plan in front of me, I duplicated each line. Then I went over the outline with a black pen - so that it was blindingly obvious before I started cutting. It takes a while to do this - but you only need to do it once. Slow and steady wins the race. I used as Stanley knife (or as the American's would call it a "box cutter"). I also went over the fold lines with the felt pen. 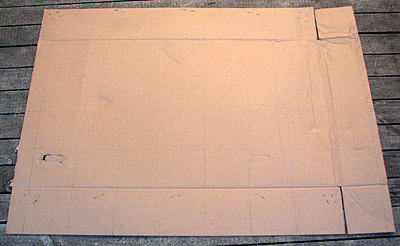 Template positioned on second piece of cardboard. There is a chance I might want to make more of these so I decided to designate this first cut-out a template. 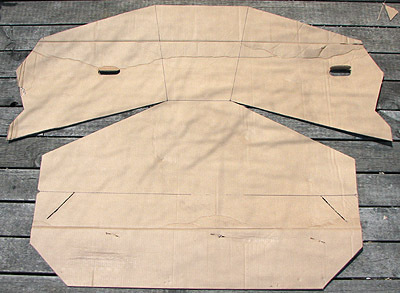 The nice thing about having a template is that I was able to position the shape to avoid rough bits of the bike box. To help locate the fold lines I also added little "cut-ins" (I wonder what the technical terms for that is?) at the end of the fold lines. I ran a pen around the template and cut the second piece out. This is quick and easy. 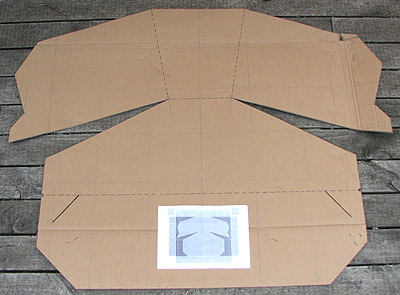 Second cardboard piece cut out. At this point I got so excited I stopped taking photos. If I make another one I promise to take photos and update this page. I cut out a piece of aluminium foil (slightly larger than the cardboard shape). Glued the foil to the cardboard. Waited overnight for the PVA glue to dry. Next morning I folded over the extra trim and taped down. Rushed outside to test it. First testing - a pot of rice. OK - here's the first test. It's a pot of rice set out just before 10am in full sun. It's a funny angle to look from - but it's an odd shape which ever way you look at it. I put it on a wooden frame to keep it out of reach from my 14 month old son. I put the pot on a half-height AG preserving jar. This allows the black pot to receive some light/heating on it's bottom too. 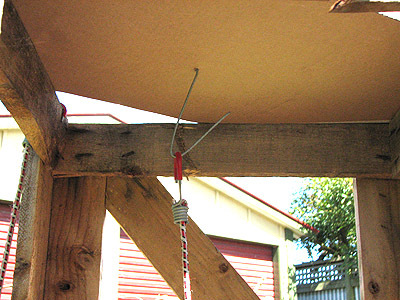 I added a bungee cord hooked from the middle of the base to keep it steady in a light Wellington breeze. I turned the cooker towards the sun every few hours. I left it in the sun til about 4pm because I was doing something else and forgot about it. The rice was over cooked but not burnt (I had too much water in the pot). We had it for dinner in a rice salad. It cooks very slowly so you don't have to worry about timing so much. My pot has a black handle so it absorbs heat too - but not enough to burn my hand. should keep it steady in a light Wellington breeze. It was sunny but windy today. I put out another pot of rice - this time long grain brown rice. By the end of the day it still wasn't cooked. I expect that was because the wind was sucking away the heat. So I'm thinking about build a simple solar oven. Hi, I've just seen on your web site that you've tried the solar cooker design which I worked up a couple of years ago. Thanks for giving it a go, it's good to see that the plans worked! I just wanted to say something about your last comment about the brown rice not cooking (I know this was a long time ago, but I've only just seen it), and it may be that you would get better results if you enclosed the pot in a heat-proof plastic bag. This is the technique recommended when these cookers are used in Africa, and in my experience it makes a huge difference to the efficiency of the cooker. These plastic bags are usually sold in supermarkets as turkey roasting bags or oven bags, and when used with the cooker the pot is placed inside and the bag is closed with a clothes-peg. It also helps to raise the pot a little off the base of the cooker, about an inch or so is plenty, and this can be done by using three small stones or sticks. 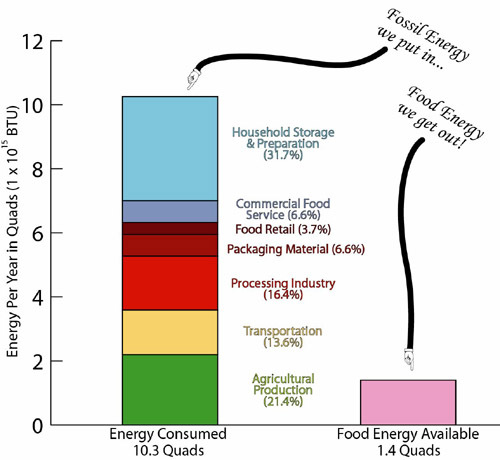 Food energy use (USA). I'm not sure how closely this matches the New Zealand situation. My hunch is the percentages are roughly similar. Source: US Food System [PDF] University of Michigan. 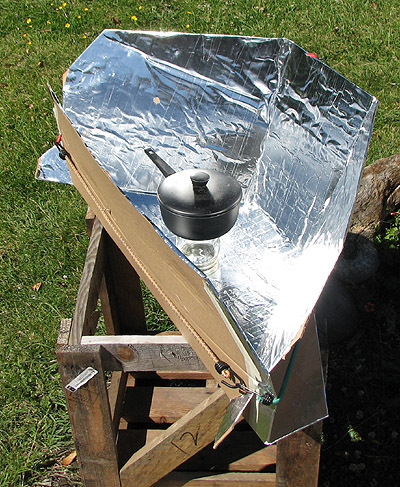 A solar cooker is both easy to make and cheap! It may even be useful - time will tell. I'm trying to reduce my carbon footprint and energy consumption. 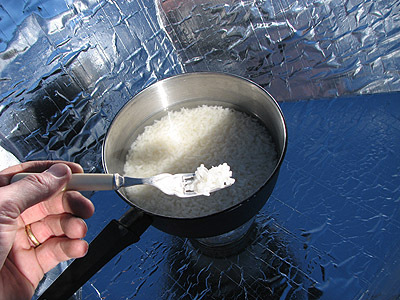 A solar cooker is potentially an energy efficient way to preserve summer veges.